We happen to LOVE our Elf On The Shelf, he brings my kids an incredible amount of joy each morning. Our Elf does not do anything to extravagant but each day he is in a new place and the kids love running around looking for him. Yesterday my kids were talking together, their friends Elf did NOT MOVE last night. You should have seen their faces, both confusion, worry and suspicion. I had to giggle as they discussed WHY they thought their friends Elf did not move. So, if your Elf happens to NOT MOVE one night…. it is best that all of us study up, and become informed as to WHY this might of happened. That way if that day ever comes, and your Elf does not move, we will be prepared and ready to handle this crisis. 1.Be shocked just like the kids are, “Hmmmm I wonder why he did not move” ask the kids the question and see what reasons or ideas they come up with. 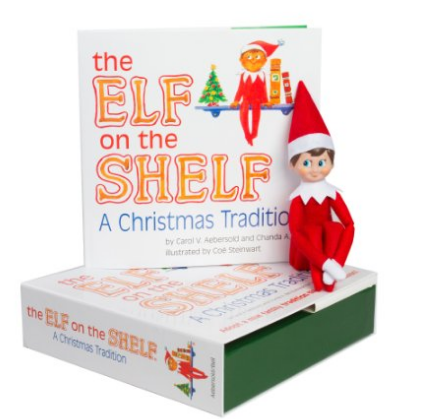 Kids are smart, clever and funny and you are sure to get a giggle when they explain why THEY think the elf did not move. 2. Well you were kind of naughty yesterday maybe he is on strike and did not fly back to the north pole last night. He is giving you one more day to improve your behavior before he reports to Santa. I bet if you are good today he will move. 3. You went to bed really late last night, I bet he didn’t have enough time to get every thing done that he needed to last night. 4. I bet he caught a cold and does not feel well, you know our family has been sick this week. 5. It is too cold out, the weatherman said it is was really cold last night I bet he wanted to stay warm. 6. He ate to much sugar and is feeling sluggish… you know all those cookies he ate last night, well I bet he has a tummy ache. 7. You woke up to early, you woke up earlier than normal go back to bed and I bet he will move when your asleep. 8. Move while your out doing errand, he does not have to just move at night. Get the kids in the car and SURPRISE he moved while you were gone. 9. I heard the cats running around last night, I bet the Elf didn’t want to get chased by the cats so he stayed put. 10. You like to wear the same clothes two days in a row… he moved, he just moved back to the same place again. 11. He stayed up to late playing with your toys and lost track of time. 12. He is so silly he is playing a trick on you so see if you remembered where he was yesterday. You are too smart for his tricks. 13. He wanted to have a sleep over at our house, and didn’t go back to the north pole last night. 14. Some times he gets to tired to fly, I wonder if he missed his flight. The wind makes it hard for those Elf planes to land. Do you have an Elf on the Shelf at your house? We started the tradition and my kids love it! Still time to grab your own Elf On The Shelf if you would like to start this tradition as well. Next articlePerfect Long Sleeve Tunic for $12.99 (was $29.99) 3 days only. Prisilla Miller for this times mom gets super busy…. Where do you buy an elf on the shelf? Are you… serious right now with this?? This is just… I can think of ten thousand reasons why this is just insanely wrong. And infuriating. Elf on the Shelf should not EVER be used as a means of parenting. A cute way to excite your kids for the Holidays? Sure. A goofy little game you can play to encourage them to remember Christmas is coming?? Great. But to use this as a means of punishment??? Or to suggest that their elf didn’t move because they “did something wrong”?? How about sitting down and explaining to your kids as an adult what you expect from them, instead of expecting them to learn from a toy? -_- And these ‘reasons’ for the punishment are absolutely asinine. You were naughty?? Then their punishment should’ve come with their actions… immediately. Otherwise guess what they’ve learned? Absolutely nothing – except maybe not to trust you, your word, or the ‘elf’ toy. You woke up too early?? How about if you buy the damn thing, be prepared to move it because your kids are SUPPOSED to be excited to figure out where it moved to. You wear the same clothes two days in a row??? Whose responsibility is it to make sure your kids are changed?? Not the elf, that’s for sure. I realize I sound like “That Person” right now, but honestly… this is just nonsense and all it’s going to do is make kids cynical, upset and lack trust in adults. Some of the ideas aren’t terrible or damaging, but the issue remains the same. You buy the elf… you move the elf. You decided to opt in to this absurd tradition – so follow through. And if you don’t want to? Be prepared to explain to your kids the reason the elf didn’t move is because mommy and daddy ‘just didn’t feel like moving it’. Don’t make up some ridiculous story because you didn’t wanna take the time to move it. Putting the responsibility on your kids and making them feel like it’s THEIR fault?? Ugh. Please please please don’t do this to your children. Tripp- Buffy Poole, you might need some of these!! I got mine without knowing it is to be moved everynight. If I move it now it would creep my kids out. Thanks for sharing it with us!!!!!! Julie Wilson the photo was awesome, and sparked a great idea! Allison Tannahill. Just in case!!! Ours is just lazy. LoL. I usually explain to my kids that I couldn’t sleep and was up really late so he didn’t have a chance to rush to the North Pole and back intime. An easy one in case you forget! Lol I hate the elf!! Thank you Emily! U0001f609 I’ve done #7 twice this year already lol. As we speak the kids still haven’t found the elf for today bc I snatched her out of the fireplace( yesterday’s spot) and threw her in a cabinet before the kids could see she hadn’t moved lol. Need this! He didn’t move last night! Why is my elf posted?!?!? My elf isn’t moving tonight. The kids never found him today. our elf didn’t move one night and was on strike because of the kids unkind words to each other. Stacy Spurling Cacciatore had just posted why is their elf so lazy. So this was perfect. Our elf is a trickster and doesn’t move every year (at least once) to keep us on our toes!! Stacy Spurling Cacciatore for the lazy elf! !